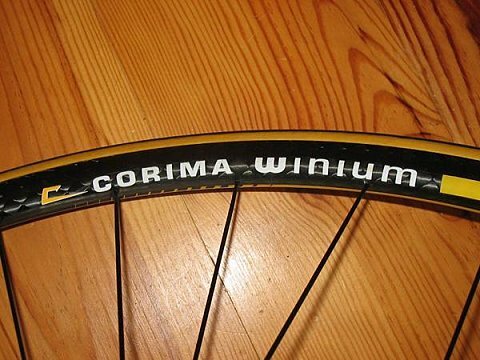 Corima Winium rims now use the 12K carbon weave, after the Aero has been upgraded at the Mondial du deux roues the last year. The look change dramatically even through the general shape remains unchanged. Both the stiffness and the weight are slightly increased. The rims are now between 300 to 325gr. Paul Lew, president and foundator of Lew Corporation, wheel maker and especially rim maker of a great quality has sold the company in 2001 to lead in 2002 Lew Aerospace. Specialized into making aerospace components for the US governement, he now comes back with Lew Racing and an experience of 17 years into composite materials. 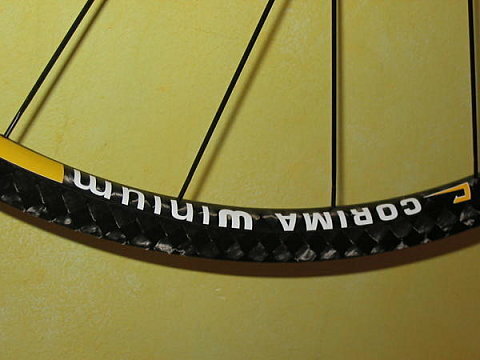 Thus, a new wheelset will be available the 27th of January 2007. Based upon the Boron and the classic carbon fiber, it will hit the scale at only 880gr for tubulars and 970gr for clinchers. It seems this wheelset reaching the moderate sum of USD5000 will use a technology close to the Lightweight or the new Mavic. Differently said, it will be a wheel "made in one part" that won’t be able to be repaired but will be outstanding. We are impatient to be the 27th of January to show you the first pictures. Wheel rim height will be 51mm and the width will be 20mm while the user weight limit is 82kg.